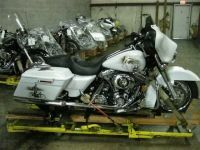 The uncrated motorcycle shippers do not use a pallet or crate. Their trailers are rigged for transporting bikes, most have tracks in the floor that your wheels fit into. They also secure your bike front and rear using soft tiedown straps. Approximate delivery time frames are listed on each quote we provide. Most shippers charge by the number of miles, not by the size of the bike (very large touring bikes sometimes cost more). If you are shipping a mini-bike or a full size cruiser the shipping cost will likely be the same amount. Pick up and delivery points must be tractor/trailer accessible. If not, the shipper may be willing to meet you at a nearby location for pick up or delivery. The shippers trucks have ramps or lift gates, loading docks are not required. The door to door enclosed trailer metal pallet shipper provides a heavy duty metal pallet and soft tiedown straps. They mount your bike to a metal pallet and secure it using soft tiedown straps on the front and rear of the bike. They transport thousands of bikes each year. Pick up and delivery points must be tractor/trailer accessible. If not, the shipper may be willing to meet you at a nearby location for pick up or delivery. The shippers trucks have ramps or lift gates, loading docks are usually not required. The door to door enclosed trailer pallet shipper provides a heavy duty wooden pallet and soft tiedown straps. They mount your bike to a wooden pallet and secure it using soft tiedown straps on the front and rear of the bike. This shipper provides a 24 hour online tracking service for your shipment via their website. They transport thousands of bikes each year. Pick up and delivery points must be tractor/trailer accessible. If not, the shipper may be willing to meet you at a nearby location for pick up or delivery. The shippers trucks have ramps or lift gates and pallet jacks, loading docks are not required. If you select the terminal to terminal container shipping option, the shipper provides a heavy duty metal container specifically designed for transporting bikes (maximum inside dimension 98″L x 44.6″W x 47.6″H). You are required to bring the bike to the shippers origin terminal and pick up the bike at the shippers destination terminal. Terminals are located near the main airports in each city the shipper services. You are required to drain the fluids and disconnect the battery prior to placing the bike in the shippers container. You are required to provide four motorcycle type tie downs and to secure the bike inside the shippers container yourself. The wheels of the bike fit into a track in the floor of the container and tie down loops are provided on the inside of the container for the tie downs to hook into. You are also required to provide locks for the container doors. You are required to unlock, untie, and remove the bike from the shippers container at the destination terminal. Note: Smaller heavy duty plastic containers are available for small bikes for approximately $190 less than the standards sized container rates listed on our Sample Rates page (maximum inside dimensions 61″L x 44.5″W x 44″H, maximum weight 500 pounds). Larger heavy duty metal containers are available for large bikes for approximately $210 more than the standards sized container rates listed on our Sample Rates page (maximum inside dimensions 118″L x 44.5″W x 59″H). The container shipping company only ships terminal to terminal. Click here for a list of the nearest Terminal Locations for container shipping. The terminals are usually open on weekdays only but most terminals are open late in the evening. Container Shipping Rates include the use of the shippers container. You can also provide your own crate, crate the bike, drop off and pick up the crated bike at the crated shipping company’s terminals. The maximum allowable outside crate dimensions are 98″L x 47″W x 50″H. You might be able to find a used crate at a local bike shop. The shipper provides insurance coverage of a maximum of $0.50 per pound of the bike shipped at no extra charge. Additional insurance coverage is available on certain routes, there is a minimum charge of $100 for $10,000 of insurance coverage if so. Also check with your bike insurance company. Your bike insurance company might provide insurance during transport. You will be able to track your shipment online from start to finish. Fluids should be drained from the bike and the battery disconnected. The bike needs to be fully enclosed. The crated shipping company requires the sides and top of the crate to be covered with 1/4 or 3/8 inch plywood. Crated shipments are required to be dropped off/picked up at the shippers terminals. Crated rates do not include the crate, you are responsible for providing the crate and crating the bike.